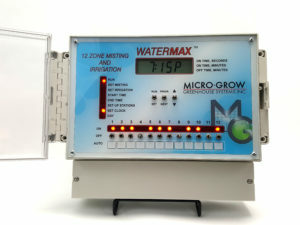 The Water Max offers some exciting features in a time-based irrigation and misting control system. Twelve individual stations may be individually set for operation times, watering days, and repeat functions. The propagation mist adjustments include separate start and stop times, as well as on and off times for complete mist cycle operations.